New 12 3/8" Victory Resin Trophy. 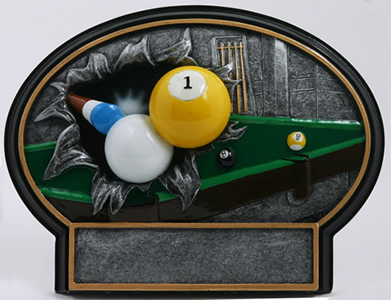 See Matching Billiards Plaques Below! Hex Style 9.25" x 11.625" Base 3.75" x 10.75"
Pentagon Style 8.5" x 10" Base 3.5" x 10.50"
Tombstone Style 8.5" x 10" Base 3.5" x 10.50"
Billiards Plate Resin Trophies - Stand or Hang!! 8" & 6" Billiards Oval Trophies - Stand or Hang! 8 1/2" x 8" Billiards Shield Trophies - Stand or Hang! Billiards Diamond Resin Trophies - Stand or Hang!